Oblivion by any other name: "Biological annihilation" and "defaunation" in the "Anthropocene" - EnvironMath! Looking at the middle italicized, and thus very important, word above first (as is only logical), it encapsulates the notion that the earth has very recently entered a new geological era, defined by the profound influence of man (“anthropos” being Greek for human) upon the earth system, and arising from the Holocene, the current (previous?) geologic era, which came about with the ending of the last ice age, and a shift in climate to one relatively warm and stable and thus able to support agricultural civilizations. While controversial, it is likely that humans played a key role in the mass extirpation of late Pleistocene (the era predating the Holocene) megafauna (“large animals”) throughout the world, and humans have been deeply involved in environmental change even before agriculture . Nevertheless, in the last few hundred years, and especially since about 1950-70, the loss of animal life has accelerated tremendously. Indeed, many markers of human impact on the globe (energy use, population, greenhouse gas emissions, global fertilizer use, species loss, etc. ), while increasing through the early industrial age (with 1750 the date typically used for the onset of the industrial era), especially with the dawn of the fossil fuel era (coal displaced wood as the world’s chief energy source by around 1850), began to increase far more dramatically after World War II, around 1950. This set of increases has been termed the “Great Acceleration,” by Will Steffen (no relation) and colleagues , who have argued that 1950 (roughly) demarcates the true onset of the Anthropocene; a selection of such trends is illustrated in Figure 1. In my view, a strong case may still be made for 1750 or thereabouts as the “early Anthropocene,” given the steady increases in forest loss and the domestication of land for human use (mainly agriculture) since. Regardless, it is on this backdrop of a truly unprecedented acceleration in human populations and activities that we face global warming, the inevitable end of fossil fuels, and, just as profound, defaunation and the emptying of the wilds. Figure 1. Selected global trends in human activity, resource use, and environmental impact from 1750 to 2010. The year 1950 is highlighted as the suggested onset of the “Great Acceleration” and possibly the Anthropocene. All curves redrawn using data reported by Steffen et al. (data available in online supplementary material). Turning to “defaunation” (from the Latin for “animal loss”), while much discussion focuses on species extinction, per se, which already vastly exceeds the “normal” background rate such that the Earth is currently experiencing a sixth mass extinction event , such discussion can overlook the massive and ongoing loss of animal populations and individuals in the Anthropocene. The term defaunation appears to have been only recently coined by Dirzo and colleagues , and it is in some sense analogous to the notion of deforestation: If 90% of a forest is cut down, few would focus on the fact that the forest is not extinct, but the fact that 90% is gone, along with all the associated ecosystems and ecosystem services. Similarly, if the forest suffered near total destruction, whether one or two trees could be located and preserved to prevent “extinction” would seem a comical exercise. Likewise for animal populations: the degree and pattern of animal loss is of primary importance in assessing biodiversity and ecosystem function. The actual degree and rate of defaunation in just the last four decades amazes: in 2014 Dirzo et al. suggested a 28% decline in the number of individual animals among vertebrate populations since 1970. Invertebrates fared even worse: Moths and butterflies declined by 35% over the same period, and other invertebrates likely declined by over 50%. And these estimates are almost certainly too low: The WWF’s 2016 Living Planet Report  reported a 58% decline in the abundance of 14,152 monitored populations of 3,706 vertebrate species from 1970 to 2012, and projected a 67% decline by 2020 if patterns did not change; Ceballos et al. similarly estimated that over 50% of terrestrial animal individuals have disappeared since 1900. While extinction as a global event is not common for any species, it is occurring on a massive scale at the local population level. That is, the wiping away of a local population from overexploitation, habitat destruction, pollution, etc., represents a local extinction event. Thus, extensive range contraction for most mammal and bird species represents the loss of billions of individual animal populations, even if these species persist overall. Most populations not destroyed in recent years are declining in abundance. Such mass extirpation of individuals and populations was recently termed a “biological annihilation” by Ceballos, Ehrlich, and Dirzo , and so we reach our final term for oblivion. These authors  examined the spatial pattern of decline of all land vertebrates across the globe, and found abundance decreases concentrated in the tropical band, especially among birds and mammals, with bird declines very widespread. A more detailed analysis of 177 mammal species showed that almost half had lost over 80% of their historic range, and most of the rest had suffered at least a 40% range contraction. The spatial pattern of range contractions/population extinctions is shown in Figure 2. Figure 2. Spatial patterns for range contraction/population extinctions for 177 mammal species from 1900-2015. Note the almost complete extirpation of these species from the majority of most continents, especially Asia, although parts of Africa and the Americas have suffered less. Reproduced for educational use (in accordance with PNAS permissions policy) from Figure 6 of Ceballos, G., Ehrlich, P. R., & Dirzo, R. (2017). Biological annihilation via the ongoing sixth mass extinction signaled by vertebrate population losses and declines. PNAS, 114(30), E6089-E6096. It is clear then, that defaunation has dramatically affected land animals across the globe. Freshwater animals have suffered even more, with a truly remarkable 81% decline in the number of individuals since 1970 . Somewhat less affected has been life in the oceans, although within the last century industrialized fishing and ocean habitat degradation have begun to take a very serious toll similar in magnitude to terrestrial defaunation . Range reductions and severe decreases in the abundance of many fished species, especially large pelagic (open-ocean) predators, have been documented, and marine vertebrate abundance decreased by 22% since 1970, while marine fish abundance fell 38% . Whales were widely hunted nearly to total extinction beginning in the 1800s, with losses of 80-90% among many species, while the blue whale population was reduced by 99% . By and large these great beasts have yet to recover. Moreover, the coral reefs that support millions of other species and protect coastlines are especially vulnerable to pollution, ocean acidification, and warming . On both land and sea, body size is a strong predictor of defaunation (but especially on land), beginning with the destruction of the Pleistocene megafauna, and now manifesting with extreme range contractions and abundance decreases among most extant megafauna . Large animals require larger ranges, are more vulnerable to habitat fragmentation, and are more likely to come into direct conflict with humans, being directly hunted or suppressed for the benefit of livestock. Riddle et al. found that the 74 largest terrestrial herbivore species have lost all but 19% of their historical ranges, mainly due to hunting, land-use change, and competition with domestic livestock. Shifting population size structures towards smaller animals affects ecosystem function, and larger animals may be especially important in large-scale nutrient transport and cycling (please note that domestic livestock are highly unlikely to replace this service due to inhibited movement and the single-species nature of most domestic herds ), are crucial to seed dispersal, and interact in many ways with smaller animals . What has driven such great loss? The main causes seem to be  (1) directly killing animals either for food, other products (e.g. fur or oil), or part of eradication campaigns to support lifestock (e.g. massive prairie dog and wolf eradication campaigns in North America to favor domestic livestock), (2) habitat destruction and fragmentation, largely for agriculture but also for logging, urban expansion, and energy exploration, (3) competition with domestic livestock, a category that overlaps with the former two, (4) pollution, e.g. fertilizer runoff into waterways, pesticide exposure (or indirect food-web effects from pesticides), and marine plastic pollution, (5) introduction of invasive species (including diseases, such as avian malaria in Hawaii or rinderpest in African hoofed mammals), and finally, (6) climate change. Young and colleagues  describe a three-step process for defaunation, beginning in the first phase with smaller-scale direct hunting and use of animal products, shifting towards more intensive, commercialized exploitation of animals in the second phase, and finally the expropriation of the animals’ ecological space itself (e.g. conversion to agriculture) in the final phase. In terrestrial and freshwater biomes, we have largely reached the third phase, with habitat destruction the chief threat, although direct exploitation remains a close second . Freshwater systems, for example, are severely threatened by massive damming, fragmentation, and withdrawals worldwide. Within the oceans, direct exploitation via industrial fishing is the major driver of defaunation, but here too there is a shift to the third phase occurring [6,9]. Ocean-based aquaculture is expanding; coastal developments (urban and agricultural) are growing; bottom-trawling methods have caused vast damage to sea floors; ghost nets, propellers, and noise pollution are all on the rise; and fertilizer and plastic pollution are increasing as well. Climate change is likely to become increasingly important as a driver of defaunation. Given the historical thermal stability of the ocean, many marine species are sensitive to even small changes in temperature, especially corals. Increasing atmospheric CO$_2$ is also acidifying the ocean, which, among other harms, inhibits shell building . On land, climate change may severely harm bird species, and is also likely to interact with habitat fragmentation that may prevent migration in response to shifting climate conditions . In sum, the situation is grim, and the hour is later than most have realized. What then, is to be done? Well, given that agriculture is, by far, the largest human use of land, and that most is devoted to the production of animal products, either directly (pasture, feedlots, etc.) or indirectly (much grain is grown for animal feed) (see, e.g. Poore & Nemecek (2018) or my commentary here), then the answer seems obvious: We must foremost decrease meat and other animal product consumption (I am hardly the first to suggest this: see, e.g. , or another George Monbiot post). Not only would this reduce agricultural land requirements and freshwater withdrawals, it could indirectly reduce pesticide use (which is strongly linked to grassland bird declines and food web disruptions) and fertilizer, and alleviate conflict between livestock and wild animals. Curtailing waste (30-50% of all food is wasted) and reducing biofuel use (about 40% of the US corn crop goes towards ethanol) would be a great boon. I will not go into detail here, but free range and organic meats are no solution at all, and in fact require more land than the conventional alternatives (see Chapter 21 and 22 from A Fair Share for supporting documentation, now available here). Curtailing climate change (of which agriculture, especially from beef and other meat production, is a major driver), transitioning the economy to one based on low-carbon energy, and ending unsustainable material consumption are also of fundamental importance, and all are profoundly linked to consumers’ day-to-day choices. 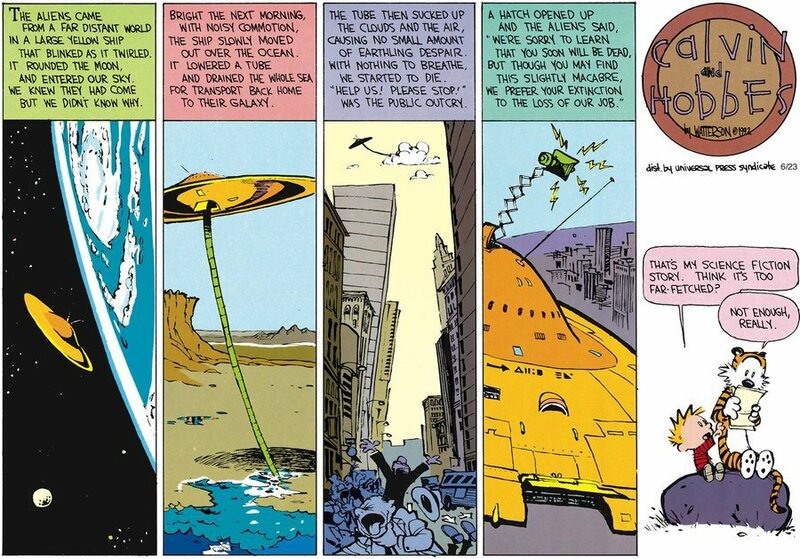 From the Calvin and Hobbes comic by Bill Watterson, originally published June 23, 1991, reproduced here under doctrine of Fair Use (17 USC 107). Malhi, Y., Doughty, C. E., Galetti, M., Smith, F. A., Svenning, J. C., & Terborgh, J. W. (2016). Megafauna and ecosystem function from the Pleistocene to the Anthropocene. Proceedings of the National Academy of Sciences, 113(4), 838-846. Steffen, W., Broadgate, W., Deutsch, L., Gaffney, O., & Ludwig, C. (2015). The trajectory of the Anthropocene: the great acceleration. The Anthropocene Review, 2(1), 81-98. Dirzo, R., Young, H. S., Galetti, M., Ceballos, G., Isaac, N. J., & Collen, B. (2014). Defaunation in the Anthropocene. science, 345(6195), 401-406. Ceballos, G., Ehrlich, P. R., & Dirzo, R. (2017). Biological annihilation via the ongoing sixth mass extinction signaled by vertebrate population losses and declines. Proceedings of the National Academy of Sciences, 114(30), E6089-E6096. McCauley, D. J., Pinsky, M. L., Palumbi, S. R., Estes, J. A., Joyce, F. H., & Warner, R. R. (2015). Marine defaunation: animal loss in the global ocean. Science, 347(6219), 1255641. Doughty, C. E., Roman, J., Faurby, S., Wolf, A., Haque, A., Bakker, E. S., … & Svenning, J. C. (2016). Global nutrient transport in a world of giants. Proceedings of the National Academy of Sciences, 113(4), 868-873. Young, H. S., McCauley, D. J., Galetti, M., & Dirzo, R. (2016). Patterns, causes, and consequences of anthropocene defaunation. Annual Review of Ecology, Evolution, and Systematics, 47, 333-358.